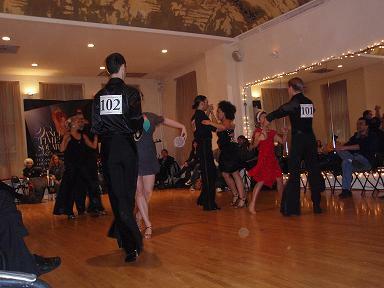 On Saturday, December 6, 2008, Dance Times Square Latin and Ballroom Studio held its annual in-house student / teacher, or pro / amateur, competition. (Full disclosure: I am a former student of Dance Times Square). Their competitions are fashioned like a regular Dancesport pro / am championship, with the studio's students, partnered with their teachers, competing against each other at all levels of Standard and Latin: from Pre-Bronze up through Silver, and Open Gold. There were 103 heats altogether, about half of which were International Standard and American Smooth, the other half International Latin and American Rhythm. This year's judges were former Latin champions Vibeke Toft and Allan Tornsberg, who also coach at the studio, and current top Latin dancer, Plamen Danailov. The judges rank the students in each heat, and also give the students suggestions for improvement, advice that becomes very useful when the student goes on to compete in a "real" championship event. Normally, Melanie LaPatin, co-owner of the studio, introduces each heat, but this year, because she and co-owner Tony Meredith were in Canada choreographing for the Canadian version of the TV show "So You Think You Can Dance," Broadway choreographer and former dancer Mercedes Ellington, who is on the studio's advisory board, emceed. Ellington proved to be a lively announcer. A wide variety of songs were played, particularly for the Standard portion of the competition, and from time to time, Ellington would run little trivia contests, asking the crowd who sang or wrote the song, or what movie or Broadway show it was from. This kept the audience on its feet. At one point, she asked the crowd what Broadway shows they had seen; people shouted out names of musicals and dramas. "Spring Awakening" had perhaps the most shout-outs. Ellington bemoaned the closing of many Broadway shows due to the financial crisis and reminded us to all go see as many as we could in the upcoming weeks so that we could tell our "ancestors there was once this great thing called Broadway." Truly sobering. Dance Times Square teachers Frederic Havez, Michael Choi, Manuel Favilla, Karolina Paliwoda, Lauren Schelfhaudt, and Magdalena Piekarz, each danced with many students, totaling about thirty altogether, the competition lasting about four hours. It always amazes me how quickly Dance Times Square students improve. Michael Choi's student, Susan Washburn, has been dancing only about three to four years and already she is dancing at a very high level of Latin and doing complicated, intricate footwork with lovely little flourishes in Smooth as well. And her social Hustle was crazy mad fun. She got many wild, well-deserved rounds of applause. Other impressively advancing students included, to name just a few, David Johnson, Elisabetta Nicotra, Bauer McQuaid, Sheryl McCabe, and Johanna McKenzie. I was told that longtime dance instructor Jacob Jason has recently relocated to California, where he is to open his own studio. New teacher Manuel Favilla, a very impressive Latin dancer with loads of charisma, has taken over some of Jason's students, and, by the looks of it, is doing quite well with them. All of the teachers at Dance Times Square, at least from what I've seen, seem to focus a great deal of attention on their students, and take great pride in the student's accomplishments. And they should. After all, if your students place well in competitions, it speaks volumes of your own skill and value as a teacher. After the competition, there was a pizza party with general dancing. It was also announced that Piekarz will be leaving the studio, to teach in Philadelphia. She's a sweet but serious instructor and she will be missed. Dance Times Square student / teacher in-house competition. Dance Times Square in-house competition. Teacher Manuel Favilla and his student.